Q: Agree or disagree: If awarded an MLS expansion team, the stadium could be a catalyst for the Downtown West neighborhood. Over 63% percent voted in the affirmative, I voted “somewhat agree” because yes, it could become a catalyst. With history as a guide, it most likely won’t do anything positive for the surroundings. Busch Stadium II (1966-2006) didn’t have much of an impact on adjacent blocks for the 3 decades it stood. Our NFL dome didn’t do anything for its surroundings either — the large site to the North is still vacant. To become a catalyst for private investment a lot of planning must happen, a form-based code adopted so every property owner contributes to the same vision. Part of the problem is the current ownership group, and the last, both want to located the stadium South of Market Street — between 20th & 22nd Streets. In February 2016 I suggested a MLS stadium North of Market bounded by 20th Street, Market, a rebuilt 22nd Street, and Pine. Only the stadium would fit, if at all. This land is also owned by the State of Missouri. This would leave lots of room for new development South of Market Street, North of Pine, etc. Looking East toward Union Station from 22nd Street, a new Fairfield Inn is under construction on the former site of Harry’s. In October it was said the hotel site wouldn’t be needed for the stadium. Across 22nd Street from the hotel, now under construction, is the St. Louis office of the FBI. Urban Stadiums should be like Chicago’s Wrigley Field, surrounded on all sides by numerous businesses that are active even on days when the stadium is empty. Not surrounded on one side by a fenced parking lot at a fortress. I doubt the FBI has any plans to relocate. The stadium would be focused more toward Union Station, presumably. Still, the best urban stadiums are surrounded by active properties owned by others. Financially the deal isn’t the worst. the land hasn’t generated any property taxes for decades, so by abating property taxes it’ll continue as it would if nothing were built. 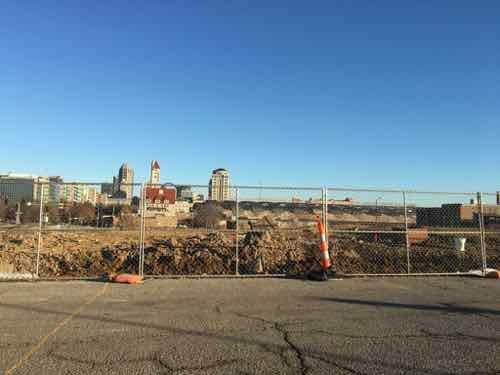 The city would wave taxes on construction materials like they’re doing with the hotel and other projects. This isn’t a huge gesture because most construction materials used on these projects aren’t bought from suppliers located in the city. This might be an incentive for the contractors to buy from city suppliers rather than outside suppliers. It’s really hard to be anything but cynical about a new stadium, likely surrounded by acres of surface parking. Hopefully I’ll be pleasantly surprised…assuming the MLS awards one of the two remaining expansion teams to St. Louis.